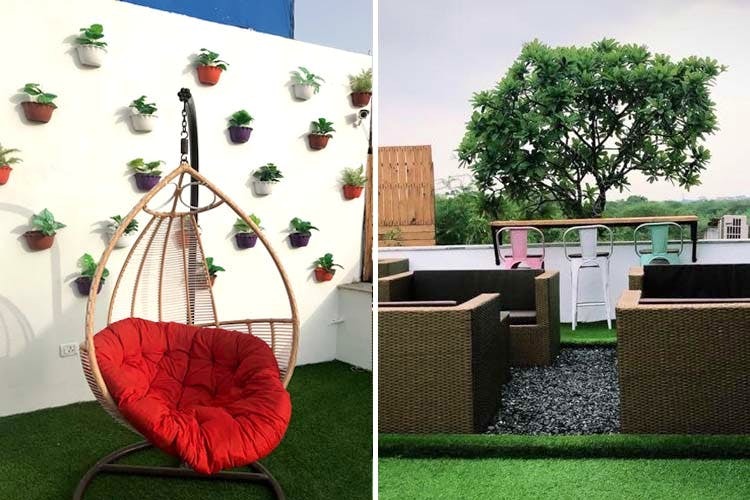 Call Your Gang: This Stunning Eatery Is Champa Gali's First Rooftop Cafe! Foresta Bistro and Cafe is Champa Gali's first rooftop bistro. While their rooftop and interiors are both decent, it is their food and the colourful stairway (tons of photo ops here!) leading up to the cafe that actually impressed us. Also, Chocolate Roast Sandwiches FTW! We reached Foresta Bistro and Cafe after climbing almost three floors of stairs and wanted to Instagram every inch of the colourful walls with portraits hung on them. You'll find cool abstract portraits on the walls inside as well. The cafe itself is super spacious with an indoor, air-conditioned area and an outdoor one with swing chairs and giant couches. Considering that the space is big and open, it makes for a nice spot for private parties too. Food-wise, we tried the Chocolate Roast Sandwich and the Mint Mojito, both of which, made us very happy. While the sandwich was equal parts buttery and chocolate-y, the mojito made the really hot day so much better. We’ve heard good things about their shawarma rolls, their Oreo Shake and their pastas too. On a good weather day, get a table outdoors at Foresta Bistro. It's just the place to catch up with your friends over some good and filling comfort food. They do not have their liquor license yet, so you might want to put a hold on those drinking plans in Champa Gali. However, we're told this will change soon (yay!). Also, in some aspects, Foresta Bistro and Cafe has a vibe that's different from the usual hipster vibe of Champa Gali cafes (maybe it's the balloons!?). Good thing or bad? You decide.